Take organic grocer Sprouts Farmers Market. It gained nearly 123% in its first day of trading Thursday – the best initial public offering (IPO) debut since LinkedIn Corp. (NYSE: LNKD) more than two years ago. IPOs as diverse as Norwegian Cruise Line Holdings Ltd. (Nasdaq: NCLS) and fast-casual eatery chain Noodles & Co. (Nasdaq: NDLS) have soared. The market has locked and loaded on about $4 billion in U.S. IPOs so far this year, Bloomberg News reports. At that pace, companies "going public" would raise the most this year since at least 1999, the financial news service says. A new survey by global consulting firm PwC shows that IPOs soared in this year's second quarter. The April-to-June period saw 62 IPOs – an increase of 88% from the year-ago period. Welcome to the white-hot IPO market. If you're not rich – you know, aren't one of those high-net-worth "accredited investors" (in essence, an insider or someone with a good buddy at an investment bank) – then you probably are watching from the sidelines. In fact, you're most likely watching from the "nosebleed seats" – or about as far from the action as you can get. 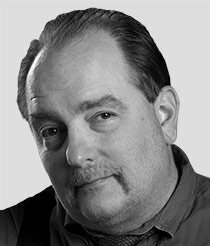 And that stinks, says Michael Robinson, our resident tech guru and the editor of the Radical Technology Profits advisory service. "I often refer to the IPO market as the 'rich-man's market'," Michael said to me during a conversation we had late last week. "And it's reprehensible that the gains are reserved for the rich." Today we're going to turn the tables. I have to confess … in case you folks can't tell … I really like the tech sector. Back during my business journalist days, I covered a number of high-tech firms, and spent a fair amount of time out in Silicon Valley – Michael's stomping grounds. I also covered the biotech sector – which is one reason you have reaped such nice gains from those types of stocks. And because Michael and I share this interest in technology – not to mention similar career backgrounds – we've become quite simpatico and, I have to admit, have become real chatterboxes. In fact, rarely a day goes by where we don't talk at least once. And we fire more e-mails at each other than the British fired cannonballs on Fort McHenry back in 1814 (one of my favorite history stories of all time – but that's for another day). Lately, I've been watching all these IPO deals and said so to Michael. "You know, Bill, I have a set of rules that I apply to IPOs," he told me. 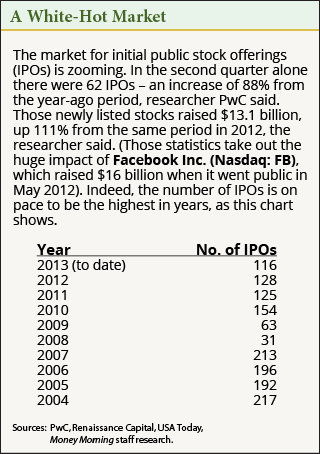 "Even better, though, I have this killer – and I mean killer – way for retail investors to play the IPO boom. When I tell people about it, I often jokingly refer to it as 'my secret passageway to the rich-man's market'." As soon as he said this, I was already planning on how I'd share it with you. In fact, as you'll see, this is one of the coolest ideas we've had here for you in some time. Not many folks know about it. Before we get into the actual recommendation, let's first talk about Michael's rules. Michael is very much a "rules-based" guy … investor. Not that he isn't a free-thinker. But what he's discovered is that his rules make it easier for his readers/subscribers to grasp his thinking … you know, a way to "package" his ideas into a kind of "bit-sized" portion for retail investors of all experience levels to understand. That's why he's so doggone good. The IPO market can be a real jungle, which means that IPO investing can be a daunting process. "As I often tell people, because Wall Street tends to reserve the hottest issues for its 'best' customers – folks I often describe as the 'ultimate insiders' of the U.S. financial markets – IPO deals can be tough for retail investors to get into," Michael explained. "And even if you do manage to get a few shares, there are still difficult decisions to make – such as how long you should hold on, or under what circumstances you should sell." As Michael says, to profit – and win – in the IPO market, you need a strategy. Too much talk. Please get to the point ! What is the stock recommendation ? As longtime readers know, one of the things that I truly enjoy about my role here is that I get to interact so much with our readers. That's why I'm always so open to their viewpoints — even when they disagree. But I have to call you out on this one — you didn't do your homework. In fact, the research you've shared here absolutely buttresses the points that Michael Robinson made in this story. A. Facebook was an IPO. B. AbbVie is a spinoff (newly minted stock) from Abbott Labs — just this year, in fact. I know this because Abbott was a recommendation in Private Briefing (and a very profitable one, at that … we recommended it specfically because it was planning the spinoff, which can be an immensely profitable transaction if you pick the right one). So that, too, is technically an IPO. C. And you seem to have forgotten that General Motors went public following the bailout … In fact, at the time of the Nov. 2010 transaction, the $20.1 billion stock offering was the biggest IPO in history. So that, too, certainly qualifies. And, as the story very clearly stated, this fund holds the stocks after their IPO offerings for 1000 days. So it makes sense that GM and Facebook would still in the portfolio. That's more than a quarter of the fund in just those three stocks. I recognize some of these others, as well, though I'm not going to go through them all. So while I know you were looking to disagree with us here, your research actually backs up what Michael said. No worries, though. It's all good. And I mean that. We always welcome input from readers. And we certainly appreciated the time you took to present this. Indeed, I give you a lot of credit for digging this out. That's the kind of initiative that makes for a solid investor. Keep it up. Looks like the First Trust IPOX-100 Index Fund (NYSE: FPX) ETF holds a lot of big-name, top 1000 (or Fortune 500) company IPO stock. I would say more large cap than mid-cap. To me, this indicates more stability, not risk. I'm not so sure of the growth potential of the large caps, but would rest easier about the decreased loss potential. When I was reading this article, I am recalling Indian IPO's. The company performance is pathetic, but still several investors are subscribing and they are able to generate good returns.